We offer Phoenix West tack trunks. We combine all of the custom options of Phoenix West with our excellent customer service to take the stress out of your trunk purchase. Click on the link for more information. You’ll want to protect your investment with a cover! Click on the link to learn the details. 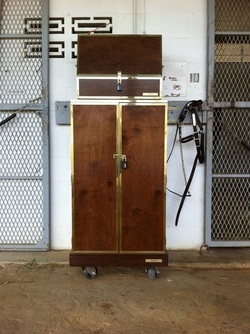 We offer a wide variety of tack room accessories to help your barn function smoothly, whether at home or on the road. All offerings can be customized with your colors and logo - just like tack trunks. Click on the link to learn more! Stable boards options are as varied as the people who use them. Click on the link to see the details.